Two-way radios are a great way to stay informed and safe during hunting trips. Perfect for allowing you to team up to take down prey, keeping you connected with important weather updates, and emergency signaling, a two-way radio may be your next best friend in terms of hunting gadgets. A two-way radio is a radio with the capability to both transmit and receive an audio signal, but not at the same time. It differs from a broadcast receiver, which (true to its name) can only receive content and cannot send out. 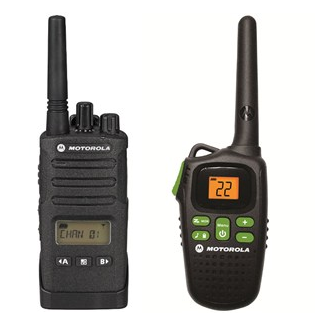 A two-way radio is designed to be used between two people using similar radios and the same radio channel. They are available in a mobile, stationary base, and handheld design. What is the Difference Between a Two-Way Radio and a Walkie-Talkie? Technically speaking, any handheld radio can be casually referred to as a walkie-talkie; however, walkie-talkies are typically designed for less rugged use and are usually cheaper. 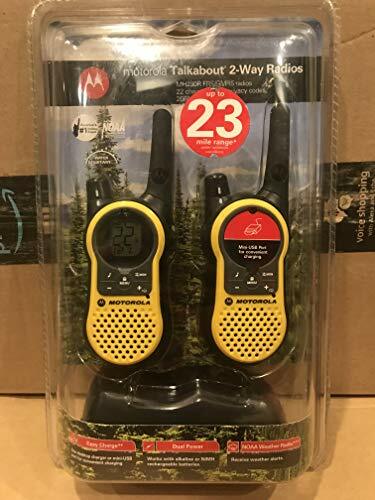 Low-grade walkie-talkies are perfect to use as a kids’ toy or for commercial situations in a pinch, but should not be used for hunting or other survival situations as they are much less reliable. 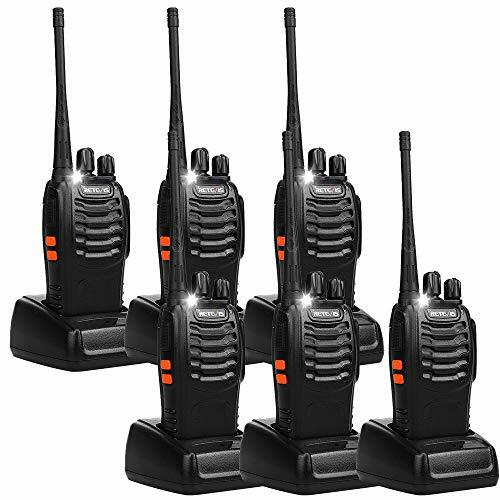 Walkie-talkies also do not come in stationary base or mobile designs, feature “push to talk” technology, and sometimes rely on cell towers; conversely, radios only use radio frequencies, which are more reliable and cannot overload. One of the most imperative details to keep in mind is the distance at which your two-way radios will function reliably. The space in which you hunt will determine which range is best for you. Not only is a longer range useful if you are covering large spaces but it also means that your devices will be connected by a stronger signal. This is perfect if your hunting area features thick brush that can cause signal blockage or dead spots. A range of at least one mile is recommended, even for hunters who are planning to team up to hunt the same game rather than rely on the radios for support outside the hunting grounds. Battery life will also determine the effectiveness of your radios. Most hunters need their radios to last for the better part of a day at the bare minimum, but if you like to go on longer trips, considering your recharging options is vital. Some radios have exceptionally long lifespans that can last for over a day, while others take AA or AAA batteries that you can pack and carry into the field. If you prefer to hunt with or close to a vehicle, some have the option to be charged via car or boat. For hunting in particular, the stealth of your radios is important. Game can be easily spooked by abnormal or unnatural noises, and many two-way radios are not built with this in mind. For this reason, many come with a headset design. Typically they are either fixed with a wire or are bluetooth compatible for better range of motion and less weight to carry. There are many amazing two-way radios available, but some are better equipped than others for the demands of hunting. Here, we’ve compiled what we believe to be the best five options you can choose from. 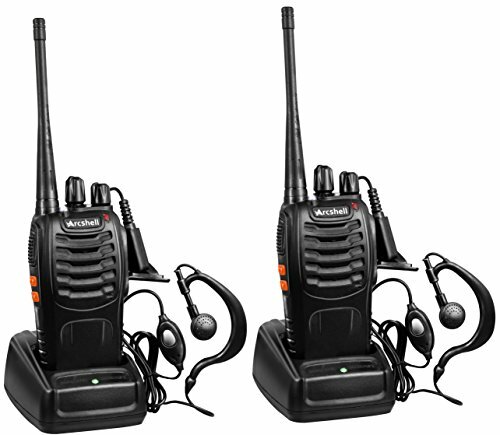 One of the best two-way radio models is the Retevis H-777. It has amazing features and functions flawlessly to deliver clear messages, no matter what. This radio set operates on up to 16 different channels and allows users to either choose a public one or a private code-locked channel for security. This model sports a rechargeable Lithium-ion battery that offers 8-9 hours of continuous use from 2-3 hours of charge. Because the battery can be removed and charged separately, extra pre-charged batteries can be packed for long trips, as well as the standard USB charging base. This product also features both a low and high power mode, so you can change the intensity based on the situation. An open field may only necessitate the lower power setting, thereby saving battery, while a forest thick with brush would generally require the higher power setting. Weighing only 108g, this radio is perfect for travel and use on the trails, especially with its hip attachment. It also has a bright flashlight for convenience in dark environments and an emergency alarm button to keep you connected in dangerous situations. It performs well in wet conditions, features no extra noises, and is compatible with a mic and earpiece. Overall, this is a great option for anyone looking for an amazing radio set that hits the basics out of the park. It is perfect for travel as it is lightweight, has long battery life and short charge time, and functions as both a flashlight and emergency signal. Providing crystal clear connection in various conditions and over 16 different channels, this radio is reliable and sure to keep you connected on the trails. This compact radio set is lightweight and perfect for travel, as it weighs only 6.3 oz and measures 4.53 inches long, 2.36 inches wide, and 1.3 inches thick. Easy to pack, carry, or holster, this won’t add any extra weight or bulk to your load. It is waterproof, perfect for the demands of hunting in the field. This set helps you stay connected in a 5-mile radius with no obstructions and is perfect for partner work. It offers 16 different channels to choose from and is easy to operate with push-to-talk technology. In terms of charging, this radio features overcharge protection, battery save, high and low options, low alert, and uses a Lithium-ion battery that uses a charging dock. It takes 2 hours to charge, and the battery lasts for up to an incredible 96 hours, making this ideal for longer trips and perfect for those sick of remembering to recharge or change out batteries. For safety, it sports an emergency alarm and LED flashlight so you are prepared no matter what happens on the hunt. It also significantly reduces your risk of scaring animals away, as it can be plugged into an earpiece. This radio set is the perfect travel companion for long trips. It is waterproof yet lightweight, has a 96-hour charge life, and features an emergency alarm and flashlight. With a 5-mile radius, it is amazing for team hunting; when hooked up to a headset, it is totally silent, ensuring no game will be scared away. The Midland LXT630VP3 is an ideal two-way radio system for those with a large property or hunting ground. It has an amazing 30-mile range, which can be even more extensive with no obstructions, and has an incredible power perfect for clear communication in dense areas. This radio set offers amazing sound quality from an incredible distance, making it dependable in intense situations. It can be used to connect to a base camp or communicate with other hunters in the area, as well as partner hunting. This unit features 36 channels to choose from as well as a scan feature and a weather scan alert system to warn you of important updates, keeping you in control and well informed no matter what. Silent operation features can be used to keep your cover from animals, so spooking them will be the last thing on your mind. This set has hands-free functions via voice activation and three sensitivity levels that allow you to focus on what matters most. It is small and lightweight, making it the perfect travel companion. Users rate this setup easy to operate, making this a good choice for anyone uncomfortable or inexperienced with radio technology. If you’re looking for a powerful radio set that can cover an extensive property, you’ve come to the right place. This two-way radio system can communicate clearly in a range of 30 miles. WIth silent mode for increased stealth, and a weather alert system for safety, no compromises are made here. The Midland GXT1000VP4 is a perfect two-way radio system for anyone facing harsh weather conditions or traveling over large areas of land. These radios feature JIS4 waterproof and splash-proof protection to extend their lifespan and make sure you can communicate clearly in any weather. It also offers NOAA weather scan, which automatically scans through 10 weather band channels to alert you of changes and potentially dangerous situations in your area. Featuring a 36-mile range, this setup is perfect for anyone hoping to stay connected to a base camp or simply hunt in a large area. This connection capability also means that its signal is strong enough to power through densely obstructed areas of a smaller radius. Privacy codes give you 3124 channel options, with the ability to block other communication. These radios come with a headset, allowing hands-free operation and virtually silent connectivity, so you won’t scare away game. Rechargeable batteries and a base charging station make this set versatile for any condition as they allow for flexibility in recharge as well as 11 hours of battery life. Each can also operate via four AA batteries per radio, a feature which allows you to recharge in the field directly. 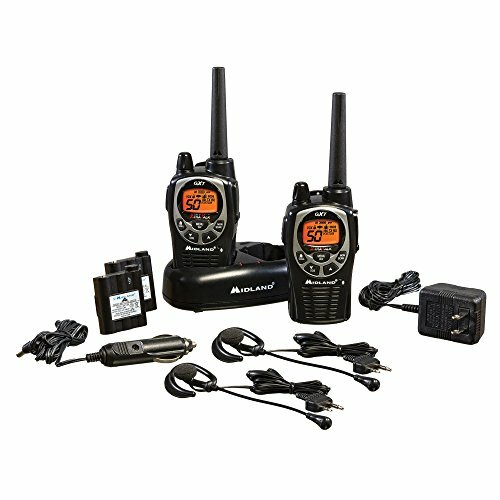 This two-way radio set is a perfect choice for those plagued by rainy weather or covering a large expanse of land. They are waterproof with a 36-mile range and offer a rechargeable battery with a lifespan of 11 hours or AA battery options. With a headset for silence, lightweight design, and many channel options, this setup has everything a hunter could want. The Motorola Talkabout Radio MH230R is a great choice for anyone looking for exceptional performance on every level. These compact 1.3-pound radios are equipped with 10-hour alkaline or 8-hour rechargeable battery life via a base charger, perfect for day trips. They can also be used with Alkaline batteries for charging in the field or for use over long trips. Featuring 22 channels with 121 privacy codes, you can feel secure in your communication without worrying about overload or interruption. These amazing two-way radios have a long 23-mile range and can be used in densely obstructed areas like forests or even urban settings. They also sport NOAA weather alert technology for safety, able to scan 11 weather channels to keep you updated on any changes or dangerous circumstances in your area. 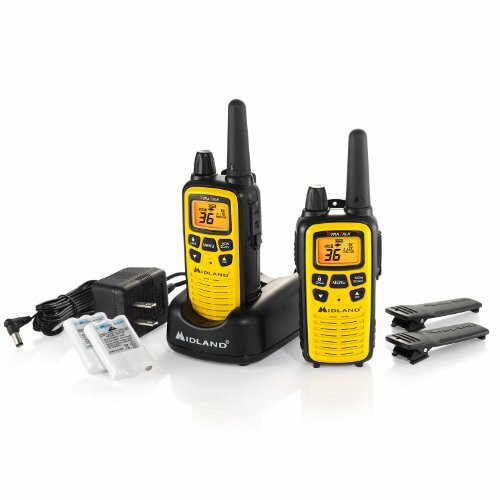 These radios can be paired with an infinite number of others, perfect for pair work or large team hunting. Compatible with a headset, they can be used handsfree and silently in the field for your ease. They are user-friendly and simple to understand and operate, making them a great choice to use with youth or inexperienced hunters. Overall, this set is amazing for anyone who is covering up to a 23-mile radius and wants solid use on a day trip. With multiple charging options and 22 channels, this radio set gives you options and keeps hunters in control. It is headset compatible and user-friendly. There are many ways in which a two-way radio can improve your time hunting. Here are some of the most universal gains made from choosing a quality product. Increasing communication when pair hunting and keeping you connected to emergency support or weather alerts, a good radio set gives you the peace of mind to hunt in places you might not have the confidence to tackle. A long range gives you the option to maintain constant communication to base camp as well. A radio set with long battery life or multiple recharge options allows you to extend your trip length where a cell phone may not last or even reach. By using radio frequencies instead of cell towers, these devices give you more options location-wise without leaving you in the dark. Hunting is all about planning and communicating, especially when multiple people are involved. Simply by adding reliable, weatherproof, and easy to use communicative devices, your hunting will be more pleasurable and productive the more information that is shared and the more communication you have with other members of your party. Two-way radios expand your hunting options while allowing you to stay safely connected to the outside world, emergency help, and other members of your party. Offering easy-to-use and often hands-free communication, radios help you stay on top of vital information without impairing your ability to hunt. Whether you are looking for a large range, extreme weatherproofing, compact design, or extra-long battery life, the perfect choice for you is surely out there.